Good morning experts, I own a Jagiar XF X260 R-Sport from 2016. I'm willing to buy a USB Hub with 2 connectors to plug in on the USB slot. 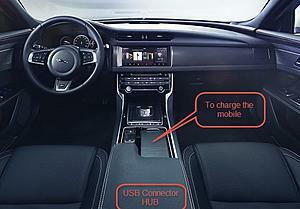 This is not to play using 2 media devices that I know is not possible, my purpose is to connect a USB stick 256Gb FAT32 (I think is the maximum accepted) to play music and the other slot in the hub to connect a USB Wireless charger for the mobile. My intention is to pass the USB cable between the USB connector and the coasters and hide the cable inside. Later on, put the Wireless charger in one coaster therefore I could leave the mobile up with the black cover closed and have it charging. Other option that I'm considering is to dismount the lighter connector for smokers and use the small black cover that is behind. Any suggestion or experiences dismounting the central panel or doing something similar? There's already a 12V socket in the center console where you can plug in a 12V to usb charger. Is that what you mean? Sure would be a lot simpler than taking out the console and it's probably already fused. Did you ever get this working? 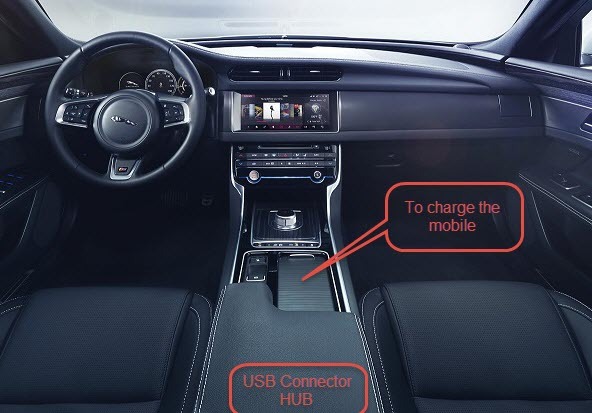 I was thinking of something similar for wireless charging under the pad forward of the gear selector. There is a power panel on the right side of the passenger foot well. Why don't you hardwire your wireless charger to it? You can fuse it as well. I don't think splitting a USB charger is a good idea. The wattage will be very weak because I don't think it goes above 500 mAmp. I doubt you will be able to power your cell phone and a USB stick at the same time.